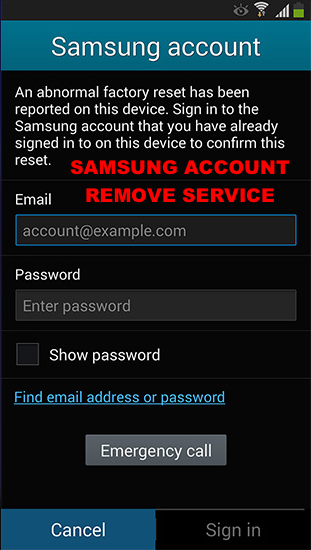 Samsung Account Lock Remove (sCloud) - Samsung Account Only. You need to login with the phone first and then remove the sCloud account from the phone through, Settings > General > Accounts, and DELETE sCloud account. Alert: When it comes to Verizon, sometimes you cannot remove it 100%. So what we tell clients is after you login through the phone, instead of deleting the sCloud, just change it to something you can remember or use your own e-mail address. Only Samsung from Verizon has this issue, other networks you just login to the phone and delete sCloud account on the phone and your are Done.